Created in 2018 in partnership with the University of Nevada, Las Vegas, and its Community Engagement program medical school students participate in an EQL internship program designed to help students gain comfort in talking with people in a variety of communities, diverse ethnic, racial, social and economic backgrounds and experiences. The Focus. Medical students participating in an EQL Community Engagement Program Internship participate in the design and conduct of fresh fruit and vegetable tasting events with community members and engage in discussions about the value of increased consumption of these items in a daily diet to prevent chronic disease. 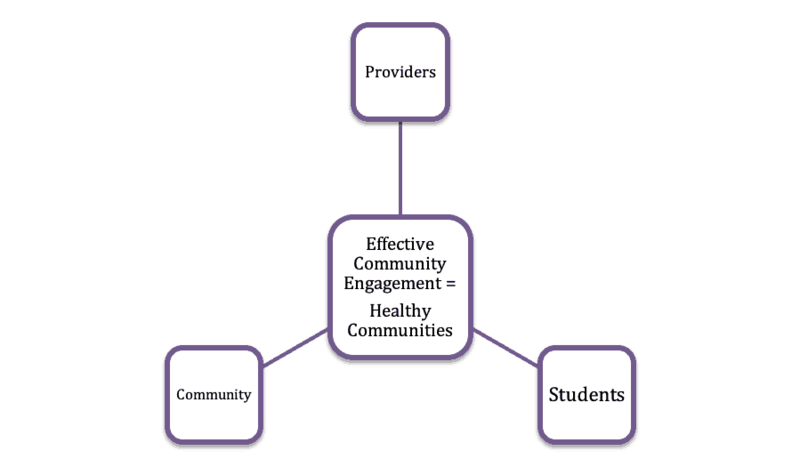 Second year students engage community members in Learning To Talk The Talk and Walk the Walk by listening to individual and community-wide health concerns, chronic health conditions, barriers to accessing and properly using care providers and tools. The Curriculum. Students work with EQL Experts and community leaders to develop monthly messages for community posting and participate in EQL events where they are paired with community members to talk about a wide range of issues, enhancing comfort levels in communicating among both. The Future. EQL is forging links with current healthcare practitioners throughout Clark County to provide engagement opportunities for students. The exposure to medical professionals who have expressed an interest in mentoring and providing meaningful community minded research experiences to future doctors is the first of its kind in Las Vegas and will expand the contacts, exposure and horizon of future practitioners exponentially. Support. To support EQL’s Community Engagement Program Internship program please send your inquiry below or contact the EQL training team implementing this project via our contact us page.